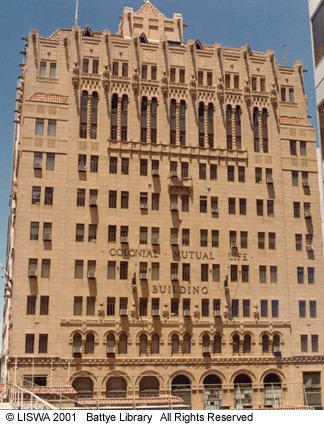 There was a mention a month or two ago of the origin of the CML building, when regular reader Robyn mentioned that it was one of her favourite buildings. I was surprised – its never been one of mine, but since then I’ve been having another look. And no worry about the vocab – I don’t know really if there is any correct words to describe its aesthetic. Suggestions welcome. “Built for an estimated 85,000 pounds, also to the designs of Hennessy and Hennessey. Like the Prudential, beautifully rendered watercolours were prepared by the architects. It is the same design as had been or was to be built by CML in Adelaide, Durban, Port Elizabeth (Sth Africa) and Melbourne. It was essentially a modernised treatment of the Romanesque style, and displayed a considerable amount of colour. 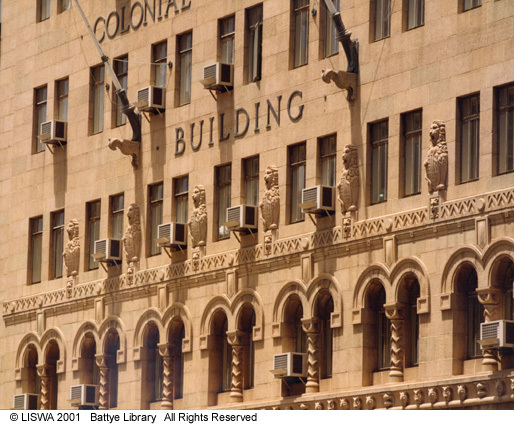 The building was distinguished by the gargoyles and heads which decorated the facade.” Constructed 1933. And they’re not joking there. 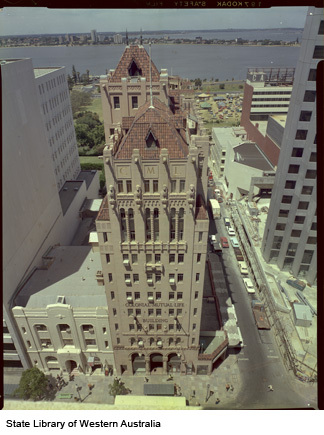 I’ve unearthed these pictures following, on the Skyscraper Cities website, where I think they are showing the CML building apparently still standing in Perth, Western Australia. Obviously this one was by the same crew at Hennessy and Hennessy as well: it looks, on a cursory glance, to have been almost identical. 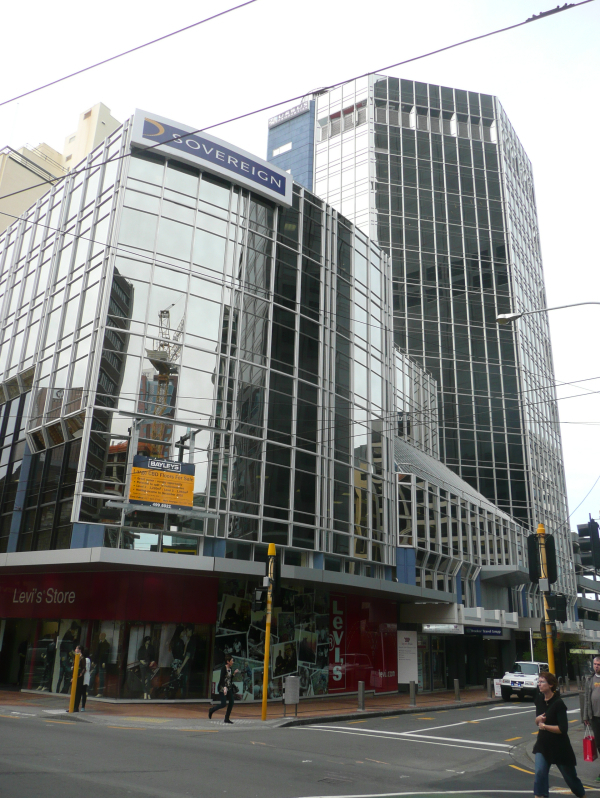 I don’t know – I think I would have got a little bit bored doing identical buildings on different cities / countries around the world – and it is kind of sad that we don’t still have this one on the books in Wellington. What we do have, of course, is the new CML building, which is also a little castellated around the edges – in fact, there is an inverse rebated zigzag thing going on climbing up the external wall. 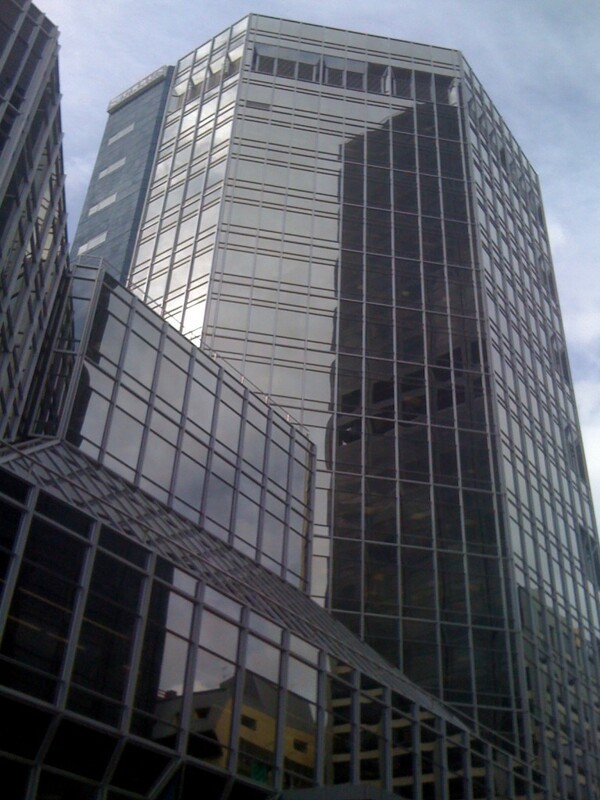 The tower is quite well finished, in strong contrast to the second, lower part, which seems to have never really recovered from the demolition of its better half. There is a large chunk of the old building on display in the downstairs lobby – looking sort of weirdly adrift – washed up, perhaps, from a ship-wrecked CML tower, and very much out of place. 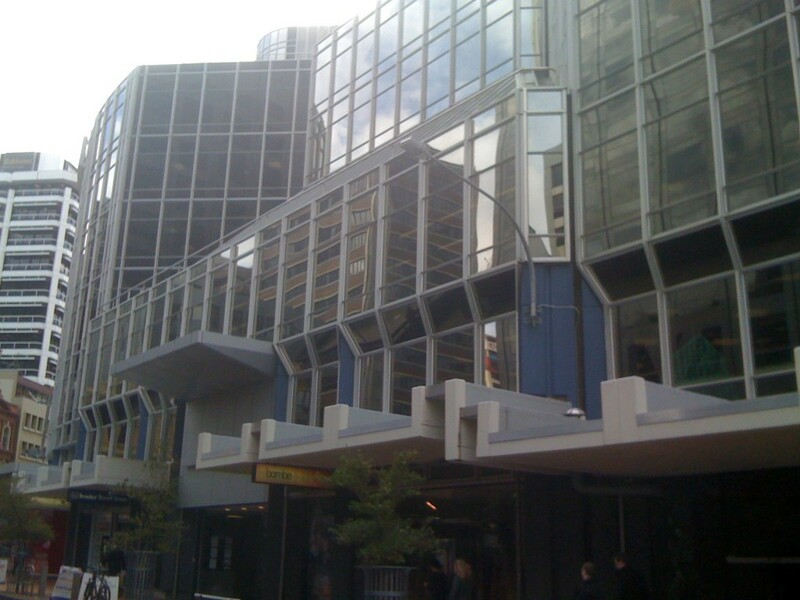 It’s the ground floor of this building that has never really felt comfortable – the entry to the tower is stuck alone on the south facing side street, the Levi shop on the corner has covered all its display windows with giant posters so that it never really feels more than just a doorway, and of course it is always stuck on ‘the wrong side of the street’. It might be the added graphology of the trolley-bus lines which always intersect any street-level view of this building, but it seems to me like a wire-frame rendering of a building rather than an actual one. All the rectilinear window joinery and the absence of interior views because of the mirror glass give it a virtual feeling. Is there any there there? Ho-hum… I guess you had to be there (the ’80s) to appreciate this one…? i think that might just be the side of the other one…? I kind of wish that intersection still had that grand feeling to it. Well, we still have two of those corners. And a sad photo – the 1980 demolition of the CML building. A boofy-haired moustached fellow glumly sits atop a bulldozer. He knows what he’s just done. Thanks Robyn for the links to those pics – far, far better than what I had unearthed. Didn’t even know that NDHA site existed. I am amused by the way that Mr Boofy hair is demolishing a stone building, with rocks and concrete falling around him, without the benefit of a roll cage or even a hard hat. Eeeh by gum, they were tough in those days. He was probably an All Black in his spare time as well. And demolishing a building by smashing holes through it at ground floor level – with the chance of everything up above coming smashing down – very bright indeed. Tragic, tragic disregard for heritage though, as well as safety…. 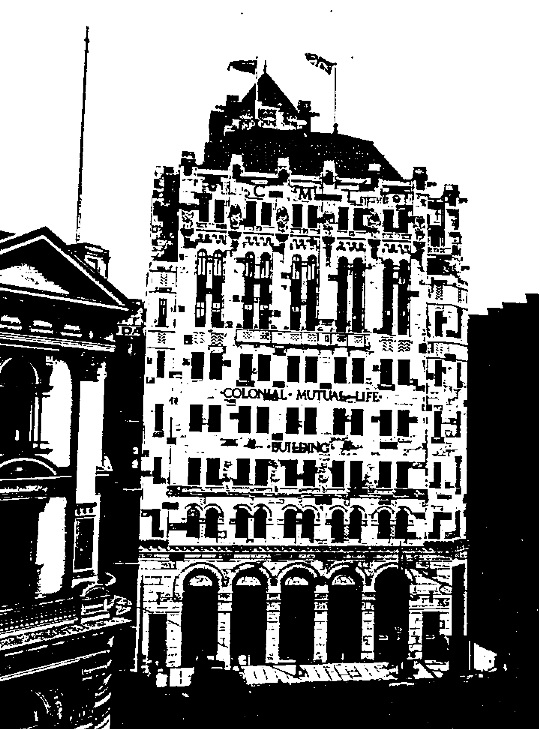 Re: the colonial clone building concept… MLC also copied and pasted their buildings… but unlike CML, their buildings still survive… on Lambton Quay (Wgtn), Queens Street (AK), and Sydney (…and possibly more)… What makes the MLC buildings interesting is the different stonework used on each building… I imagine this would have also been the case with the CML buildings – finished in local stone.